Chia Seeds are an amazing food. They absorb the flavor of the woods around them, are a seed, yet can also be used as a thickening agent. We use them in smoothies, pudding, veggie burgers….pretty much everything. Make sure to bookmark my favorite Chia Seed Recipes because you will fall in love with them too! Now, onto today's delectable recipe! 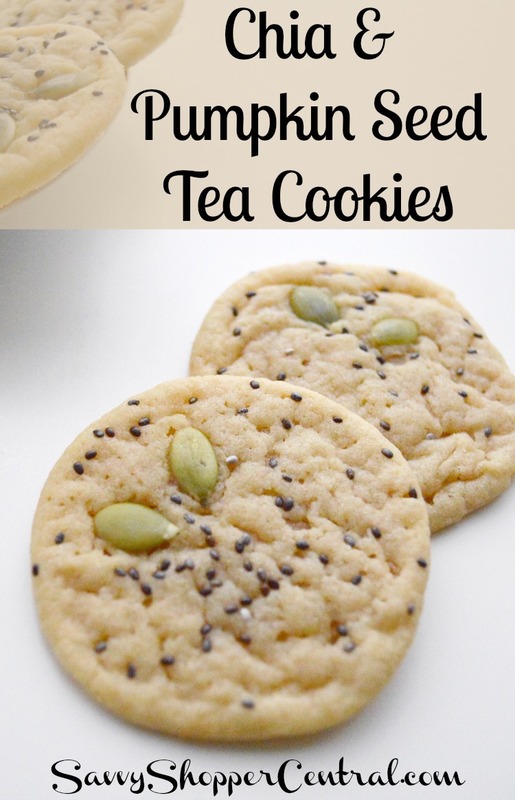 Like most kids, mine love cookies and other baked treats. I love baking, but not watching the scale climb back up, so I've been looking for healthier alternatives. Adding in seeds, nuts, and fruit has been working really well. 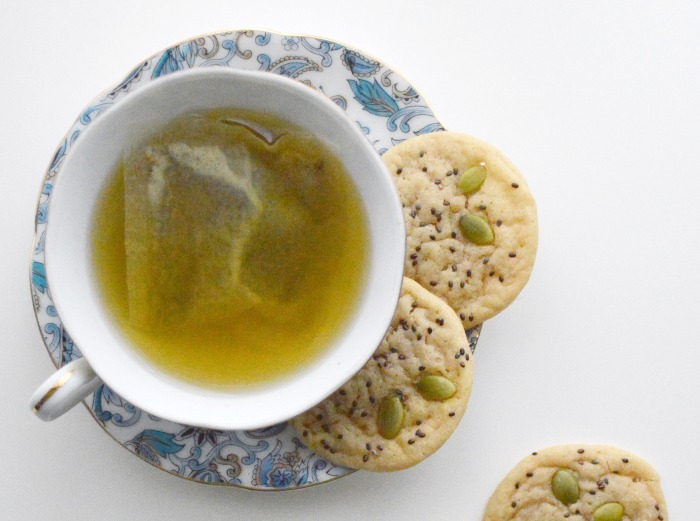 These Chia & Pumpkin Seed Tea Cookies are to die for and the kids love them too! Another great thing about this recipe: you can make up the dough and freeze it! 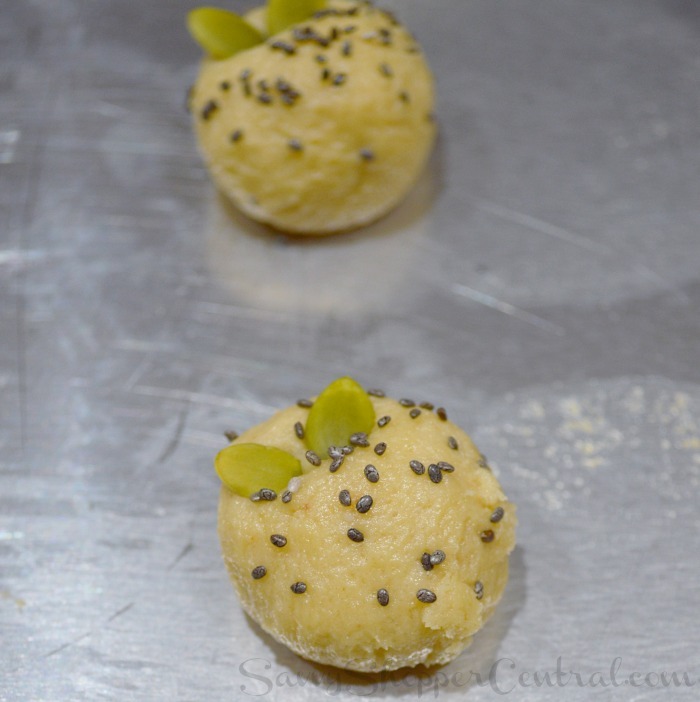 I freeze it as a log (roll in freezer or wax paper), thaw, and then form the cookie balls. Sift together the flour, salt and baking soda and set aside. Cream together butter, sugars and eggs for about 3 minutes or until smooth, add in the vanilla. Slowly start to add in the flour mixture. When fully combined roll dough into balls that are 1-1.5 inches around. You have two options for adding the chia seeds. You may roll the ball (either just the top half or entire thing) in the seeds, this will give you full coverage of the top of the cookie. Or you may sprinkle them on top of the dough and then lightly press in to make sure they stay (this is the method used in the photos). After adding seeds place on tray and add pumpkin seeds, again, pressing in slightly. Space the dough about 3 inches apart. Bake for 10-14 minutes (every oven is different so keep an eye as you approach the 10 minute mark. You will want the cookies to be slightly under cooked for a perfectly chewy finish even a couple days later. As soon as the cookies come out of the oven remove from the tray and place on a clean, cool counter. Let them rest there until fully cooled. Store in the refrigerator for the freshest taste. Your Chia Cookies look fabulous! Thanks so much for sharing with Full Plate Thursday and have a great weekend! These look yummy! I’ve never had tea cookies like these, but I’m hoping to try! Thanks for linking up with us at our Weekend Wind-Down Party! I also have a chocolate chia seed cookie over at AThriftyTable.com that you may enjoy! This looks great, I’ve only used Chia seeds in a green smoothie – thanks for sharing. Thank you for linking up with us at the #WWDParty, enjoy the weekend. Our favorite is Chia seed pudding. They are so versatile and a nutrient-dense food! Savanah, I’m featuring your cookies this week! Thanks for sharing them at Foodtastic Friday!